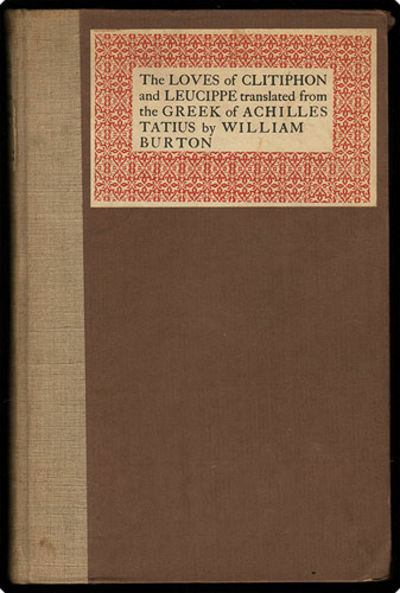 The loves of Clitophon and Leucippe translated from the Greek of Achilles Tatius by William Burton reprinted for the first time from a copy now unique. New York: Bernard Guilbert Guerney, 1923. Folio (30.5 cm, 12"). xxxi, , 152,  pp. First printing of this edition of what's sometimes spoken of as a sort of protonovel; based on Thomas Creede's 1597 printing of the first English translation, it is here edited by Stephen Gaselee and H.F.B. Brett-Smith. The volume was printed at Stratford-upon-Avon by the Shakespeare Head Press, on Batchelor's Kelmscott handmade paper with untrimmed edges; the title-page is printed in red and black.